The season is almost over for the 2014 Tennessee Titans and judging by twitter reaction it can’t come too soon for their fans. The struggling Titans dropped their 9th straight loss on Thursday Night Football to the Jacksonville Jaguars 13-21. 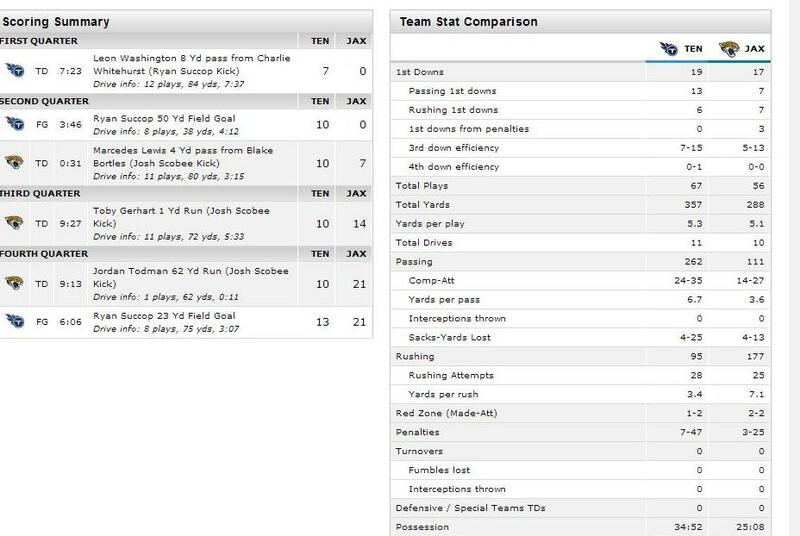 The last time the Titans won was Week 6 when the two teams faced each other. We bring you our Titans at Jaguars recap. The Titans started out fast but the sizzle was soon gone. The Titans dominated the first quarter and much of the second but only had 10 points to show for it. The Titans were up 10-0 when the Jaguars completed an 11 play 80 yard drive ending in a Blake Bortles pass to tight end Marcedes Lewis for the touchdown with only 37 seconds left. The Jaguars got going in the second half and took a 14 to 10 lead when Jaguars running back Toby Gerhart punched it in from the one yard line to put the Jaguars on top. They would not relinquish the lead. A 62 yard Jordan Todman touchdown run would put them up 21 to 10 over the Titans who would only be able to add a field goal in the 4th quarter. The run game was once again the Titans Achilles heel. Unable to run the ball or stop the run, the Titans offensive numbers were much better but the Jaguars were simply more efficient. The Titans gave up 177 rushing yards and two touchdowns to the Jaguars last night. Jordan Todman especially fed on the porous Titans run defense. 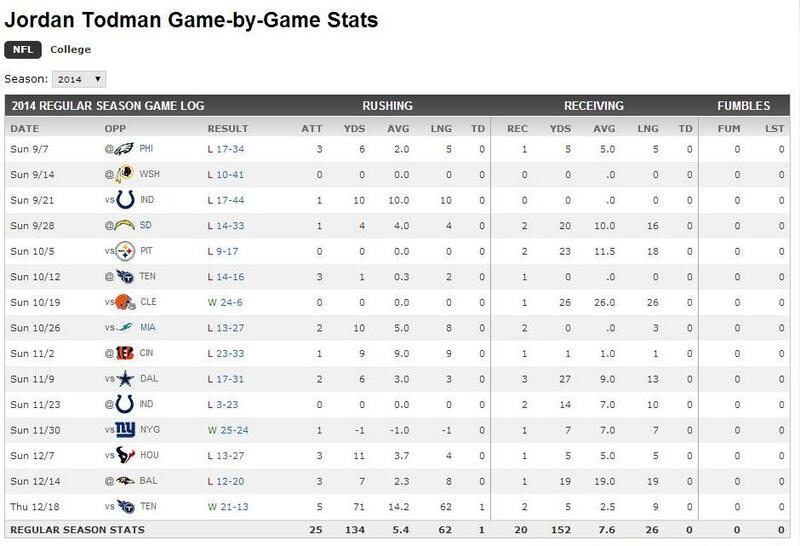 Todman had been fairly mediocre this year but tis the season and the Titans run defense has been very giving this year. Charlie Whitehurst has been a solid backup for much of the season and he did have moments last night where he did very well. He is a career backup for a reason though. The Titans were only able to put up 13 points against the Jaguars. Leon Washington out snapped Bishop Sankey 31 to 24 and yet the Titans did not use him in pass protection a single time per Pro Football Focus. I remain baffled by the Titans use of their running backs. Sankey is the best of the bunch but he never gets enough opportunities to really get anything going. You can’t blame it entirely on the offensive line either as offensive guards Chance Warmack and Andy Levitre have shown some improvement over the past few games particularly in run blocking. At some point, the Titans are going to have to commit to fixing this glaring hole in their offense. There is only one game remaining in the regular season so it might take the offseason and into next year but its a real problem that has to be addressed. Titans outside linebacker Derrick Morgan was the star of the show on defense. Morgan had an excellent game and now currently leads the Titans with sacks at 6.5. He also led the team in defensive stops with 5 per PFF. Morgan is a free agent following this season and has played very well at outside linebacker in the Titans 3-4 defense. Morgan is a versatile player who was a solid defensive end and can play multiple positions. The Titans have shown no signs of retaining him so his free agency should be quite fun to watch. The Titans did some interesting things in their defensive packages particularly in their secondary. First, outside cornerbacks Jason McCourty and Coty Sensabaugh flipped between the right and the left positions. Also, the Titans used George Wilson as an inside slot corner pulling him up on the line when the Jaguars went 4 wide. Mike Griffin was brought in to help on coverage too while Marqueston Huff played some safety. Huff made some nice plays especially the following. It was a bit of a rough game for Coty Sensabaugh who started out playing well but appeared to wear down at the end of the second quarter. Sensabaugh has struggled with some injuries this season and has not looked the same since returning from an MCL sprain where he missed three games. He needs an offseason to rest and recover. The Titans defense has played far too much this season and that is particularly hard on the secondary guys who generally play larger percentages of the game. There is at least some rotation at defensive line and linebacker. The defensive backs have played a lot. I would like to see more Huff in the final game against the Colts. The Titans now get a break since they don’t play until a week from Sunday when they will return to L.P. Field for their final game of the season against the Indianapolis Colts.